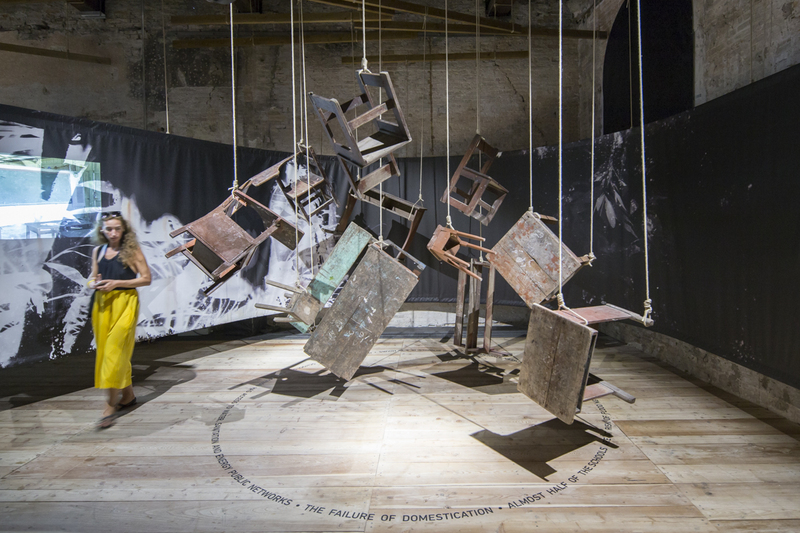 The 2016 Venice Biennale is now open to the public until November 27, 2016. 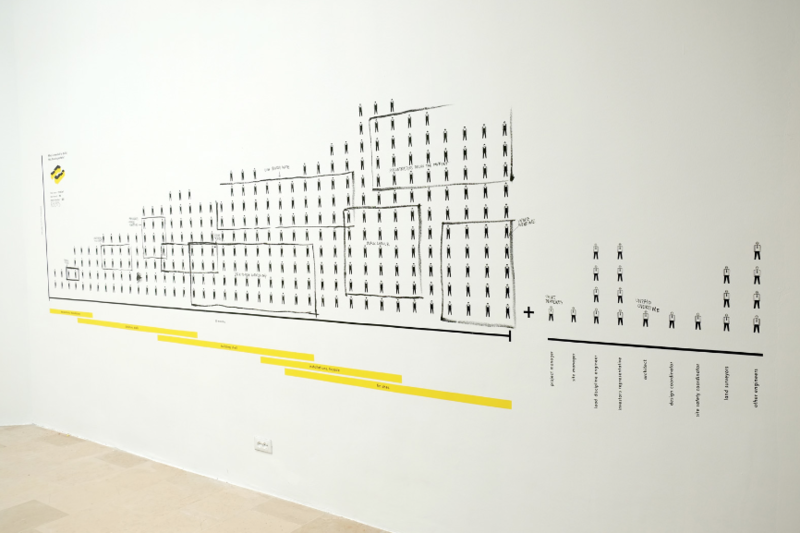 “Reporting From the Front” is Chilean architect Alejandro Aravena’s manifesto of sorts, a gorgeous aesthetic project with a slightly less clear political overlay. In this Biennale, he was looking to share success stories from engaged practitioners who are working to address the problems facing the world, such as inequality, crime, waste, traffic, and segregation. AN had three editors and a cadre of writers scoping out all of the main exhibition, the national pavilions, auxiliary events, and any other interesting things happening in the city during the opening. We selected 20 of our favorite moments and have awarded them AN Lions, a different take on the Biennale. This collection should also serve as a guidebook of sorts so that visitors throughout the summer can get some perspective on what to see, and how to get to the good stuff, without taking a whole week! 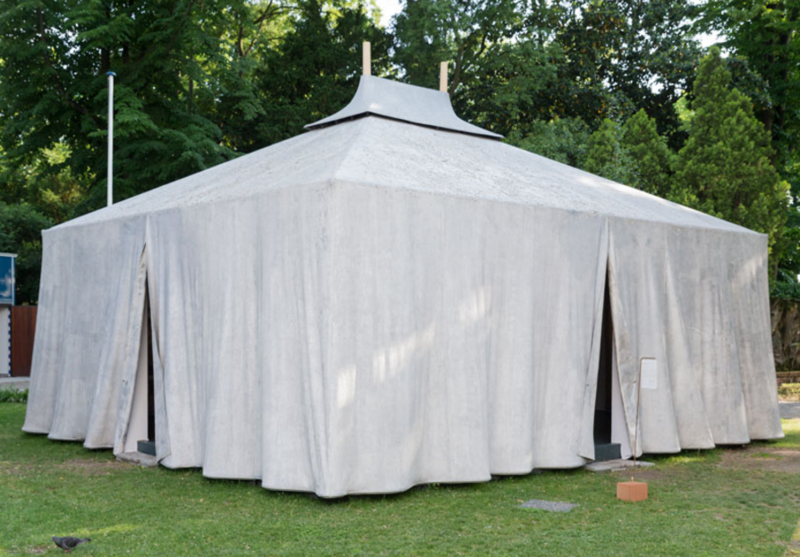 In one of the bolder moves of the Biennale, Aravena assigned Swiss architect Manuel Herz and the Western Sahara a small spot on the lawn where last year sat a wooden replica of Le Corbusier’s Maison Dom-ino, constructed by the Architectural Association. This year’s small, tent-like structure occupied a prominent space in the Giardini, giving the contested nation-state of a place alongside Belgium, the Netherlands, and Finland. 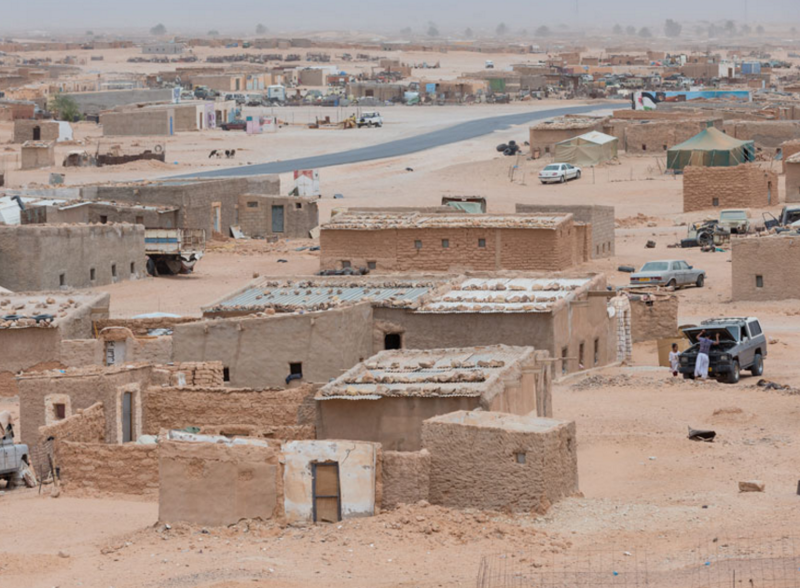 The Western Sahara is a region that has been occupied by Morocco, so Herz commissioned a set of photos by Iwan Baan, and a set of large carpet-like tapestries produced by National Union of Sahrawi women in the “permanent” refugee camps where the Sahrawis have been living since the occupation forty years ago. A project of the Victoria and Albert Museum and curated by Brendan Cormier, the exhibition shows the complex history of copying, including its role as a form of preservation, museological imperialism, resistance, and reportage. Starting from the plaster casts of the V&A’s 19th century Cast Courts, Cormier gathered contemporary projects that explore copying as an active engagement with the geopolitics of art, architecture, and culture. An illegally scanned bust of Nefertiti is on display, made possible by two artists who “took” it digitally from Germany’s Neues Museum in solidarity with Egypt’s pleas to return it to its original location. If you have been wondering why the passing of Zaha Hadid was so important, then this show will let you into the discussion. If you already loved her work, this show will make you love her more. With original paintings, models, and drawings filling every inch of a baroque palazzo, this show presents Hadid’s work that has rarely been seen anywhere else. 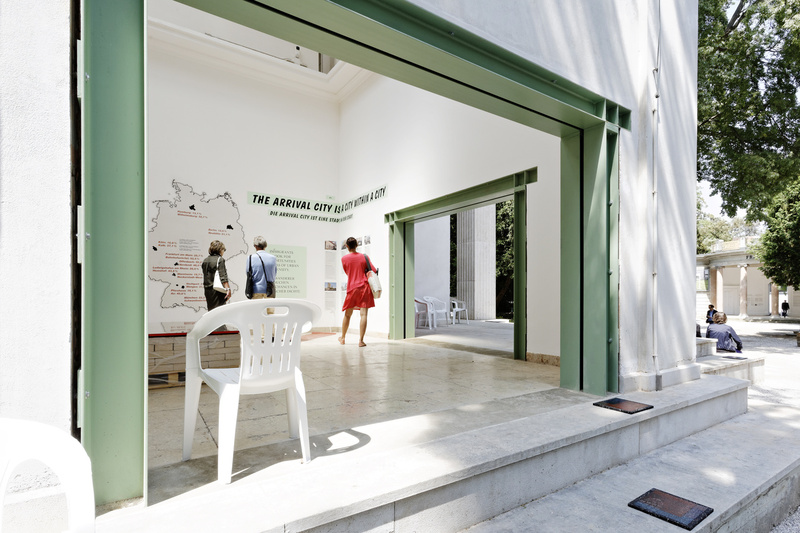 The Belgium Pavilion takes a look at the effects of scarcity on architecture. 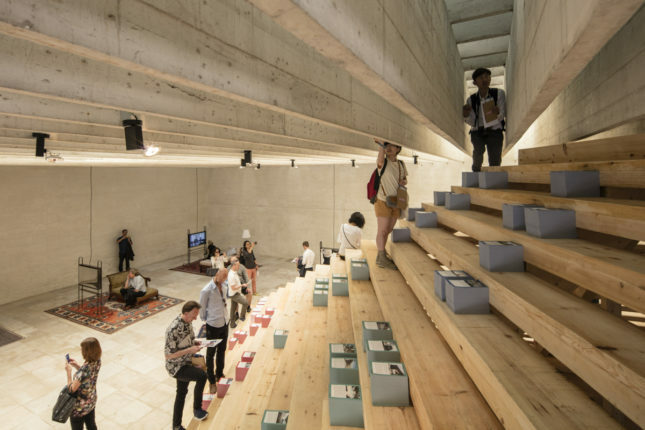 The pavilion, which has not been completely refinished since the last biennale, is filled with projects that blur the lines between built and speculation. 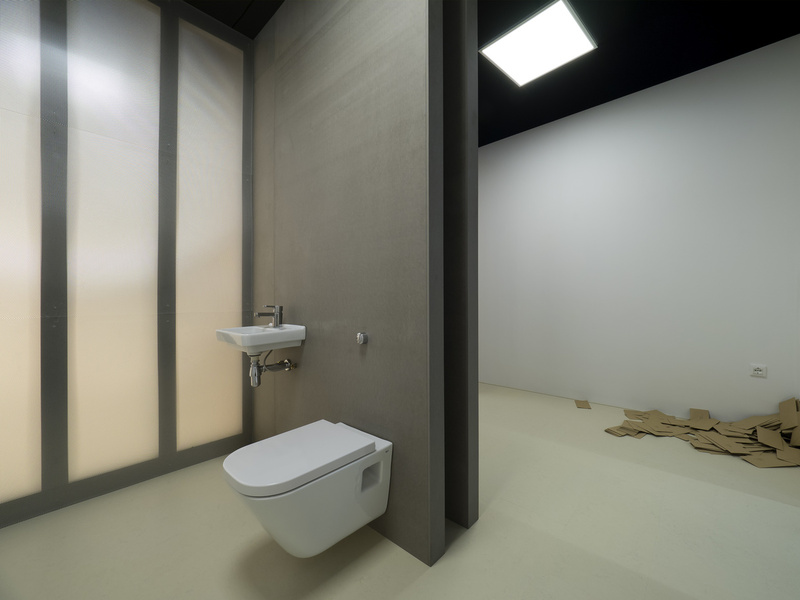 The large images by Filip Dujardin are a highlight. This pavilion highlights the dirty little secret of architecture: The workers who build (and sometimes die) in construction. Architecture is social in construction, reception, and use, yet those who actually construct buildings are invisible to most architects. 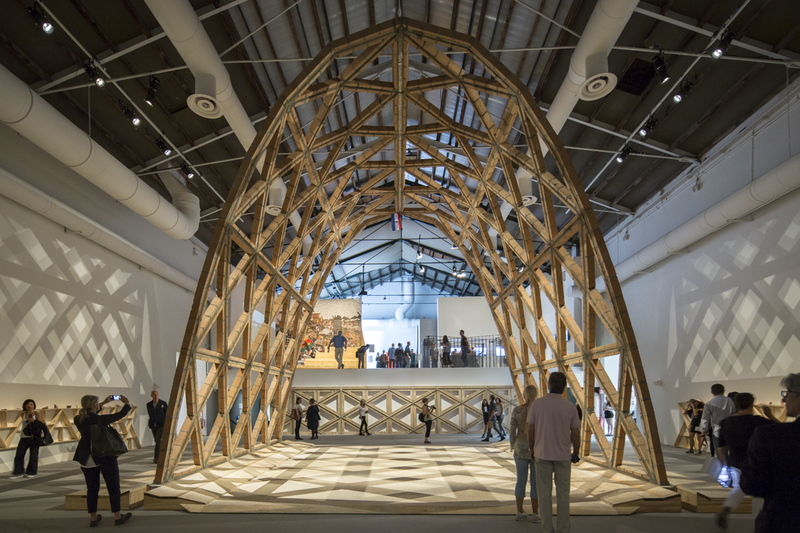 This pavilion, appropriately installed inside a grid of scaffolds, calls for “Fair Trade” buildings that recognize the value of construction labor. In this pavilion titled “Our Amazon Frontline,” the Peruvians highlight the traditional native visions of the ecologically valuable Amazon with modern ones and try to restore dignity to the native peoples of the region. A beautiful pavilion with an elegant-but-cheap display system of ropes holding plywood displays that focus on modular schools for the children of the region. It’s easy to miss but don’t! 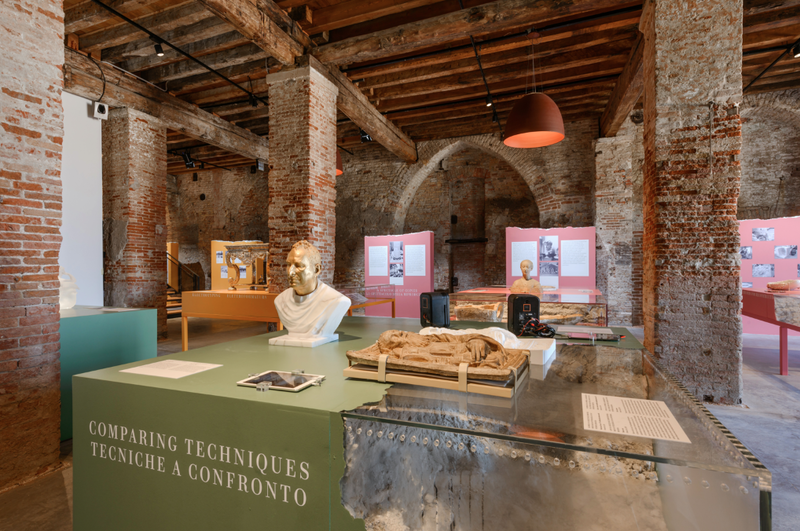 One of the most interesting venues—the spectacular Palasport gymnasium just around the corner from the Arsenale entrance—was the perfect venue for a sprawling, three country Baltic exhibition. The three countries banded together to display the history of resource extraction in their region. 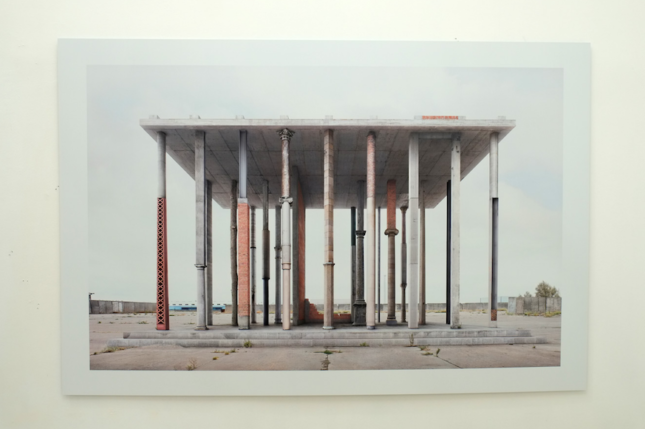 The display of post-Soviet infrastructures and the geologies, for some, will be a welcome large-scale project in the sea of smaller interventions at the Biennale. 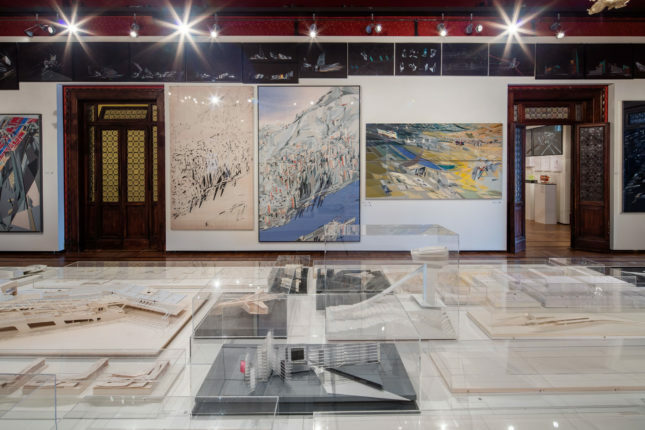 This installation is a response to those critics who argue that, while they agree with Aravena’s crises theme, there is no beauty in this biennale. This small, easy-to-miss installation tucked away in the Central Pavilion mezzanine is all about beauty. It argues that beauty is not an added layer of good taste but the capacity to capture and express human desires. The dark space was an inspiration to stumble into after a long day of forensic research. 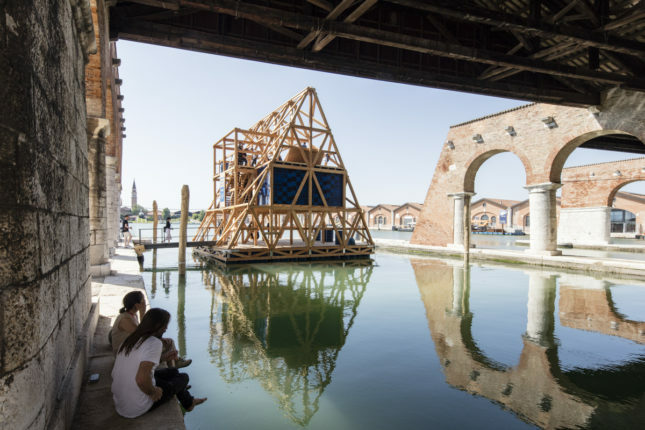 This beautiful installation hidden in the back of the Arsenale takes the “building on stick” trope to a new level by suspending hundreds of wooden buildings that are attached to a spring-loaded plywood floor. This produces a chilling, quaking effect that provides the underlay for the nine projects. The earthquake-proof educations facilities are models above the sea of shaking buildings. Led by Jack Self, Shumi Bose, and Finn Williams, the British Pavilion addresses structural problems in the late capitalist housing market. It is a slightly more cynical version of Aravena’s position on scarcity. They propose new models of living that are rooted in real estate models and lifestyle arrangements. 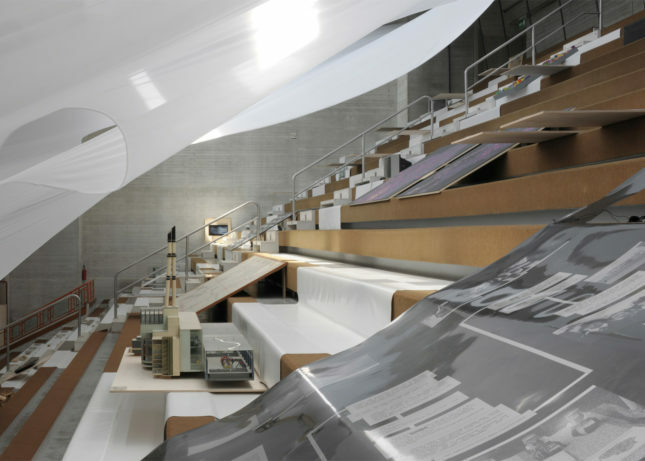 While it is impossible to escape the logic of the market, the British Pavilion looks at its structural foundations, from mobile technology to minimum furnishings to getting a mortgage, and projects possible futures ranging from inflatables to a bunk-like unit. If only because of, or in spite of, the controversy surrounding the U.S. Pavilion, it is well worth seeing. Controversy aside, the pavilion holds some of the most beautiful drawings and models in the entire biennale. If you don’t agree with what you see, simply download the augmented reality app from Detroit Resists to see the pavilion through a new lens. We have all seen Kunlé Adeyemi’s floating school barge on the internet for the last couple of years. 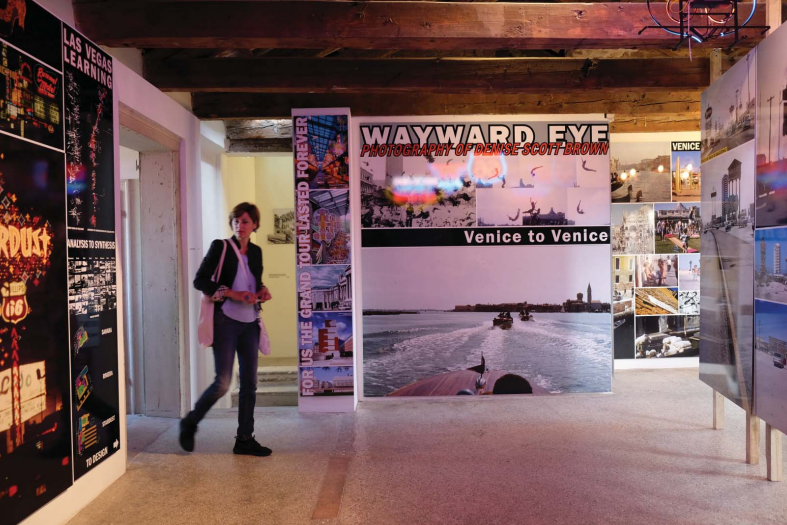 It makes a celebrity appearance at this year’s biennale after a trip down the Grand Canal. Perhaps it’s like the “Reporting From the Front” version of Aldo Rossi’s Teatro del Mundo, the floating companion to Strata Novissima (1980). Adeyemi originally designed the floating school structures for the lagoons of Lagos, Nigeria, where access to education is an ongoing struggle. The version that appeared in Venice is actually a second generation Floating School that has bigger structural members. The original was decommissioned and has since come down in Lagos. A spectacular start to the Central Pavilion, this brick structure hovers over visitors, giving a beautiful form to what Aravena calls “scarcity.” The architects claim it is built with just bricks and unqualified labor, which might be an exaggeration, but nonetheless, it is a stunning piece of architecture, and it won the Golden Lion for a reason. 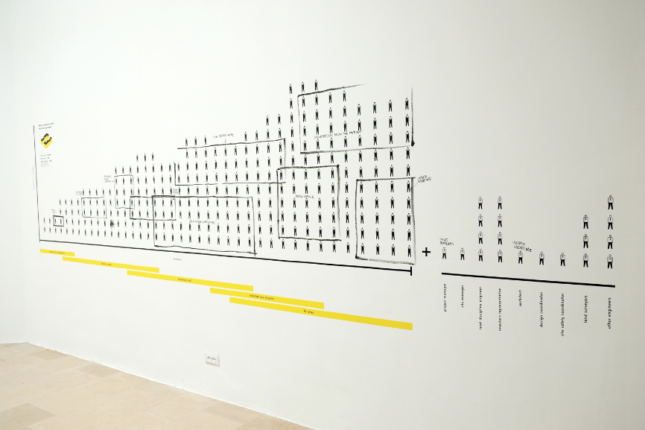 The sublime Serbian Pavilion takes a look back in on architecture and critiques the treatment of freelance and intern workers. The boat shaped blue room is devoid of architectural proposals, and instead is meant to be a respite from the rest of the show. The pithy description and pile of thousands of intern rejection letters at the entrance give you something to read while recharging in the space. 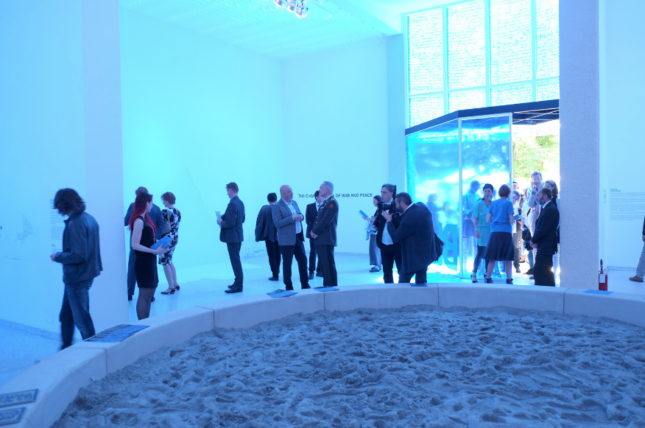 The German Pavilion is a must-see, especially if you have been to a past biennale. Winning a battle to alter the historic building, the curators cut four large entrances in exterior walls, changing the entire space of the pavilion. The wall graphics are a bit heavy handed and the message of openness is a bit literal, but it is a great place to rest and congregate. 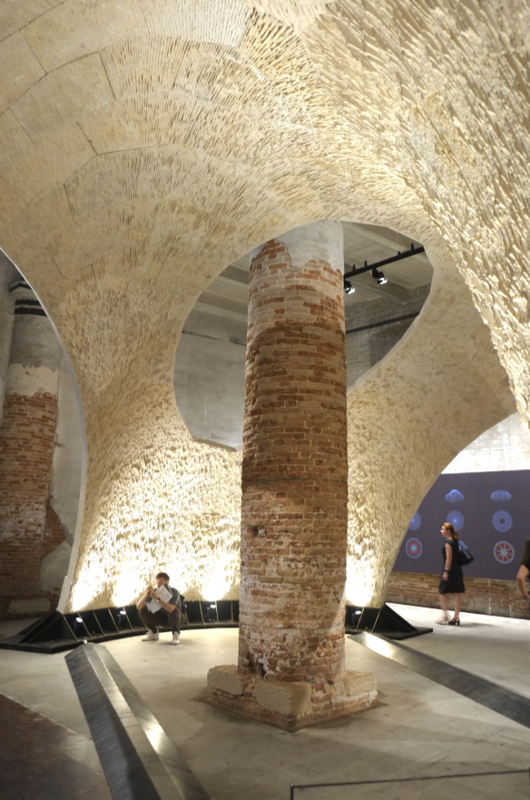 This exhibit in the Arsenale makes a case for compression in building. Rejecting the flatness and tension, the War on Bending produces a spectacular vaulting space that is held in place completely be compression. 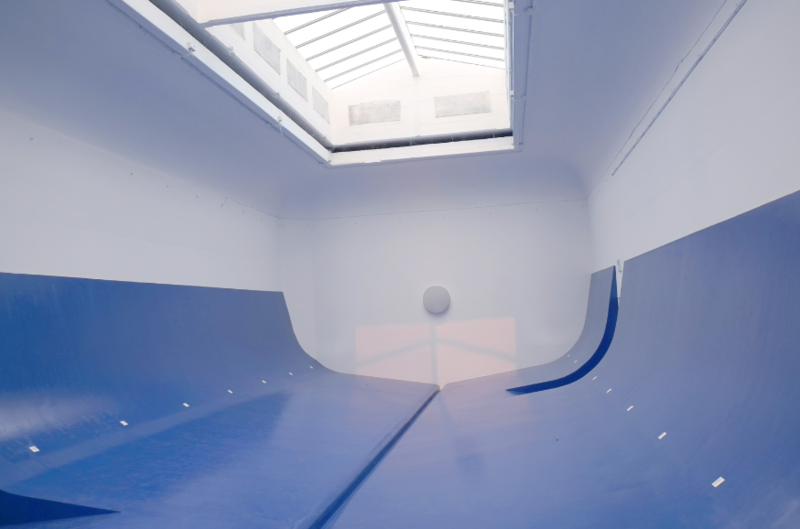 Of many of the material-based projects in the show, this one is the clearest in showing how old and new technology can be blended to make evocative space. The Dutch Pavilion is a simple but brilliant idea to highlight United Nations peacekeeping mission buildings that can be usefully repurposed if and when the peacekeepers move on. 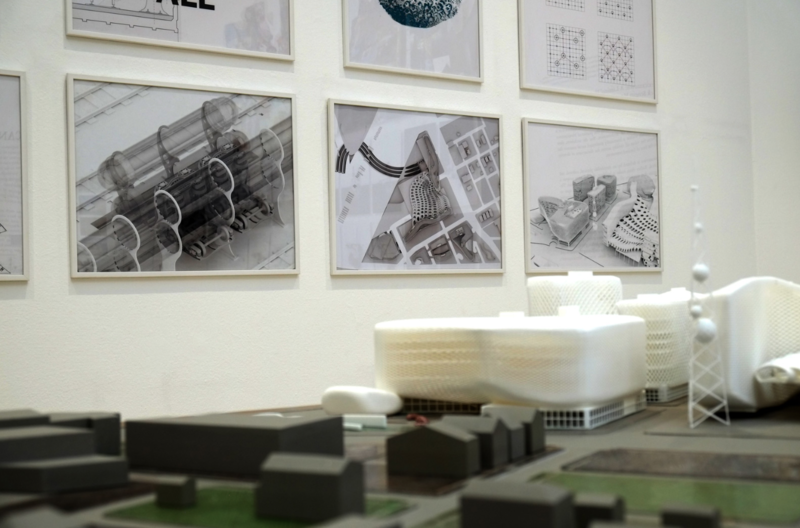 Curated by Malkit Shoshan of the think-tank FAST, it highlights the spatial challenges and opportunities of this complex situation and proposes that design be made part of peacekeeping buildings and be based on the conditions that arise post-peacekeeping mission. The Uruguayans challenged visitors to don “invisibility cloaks” and steal items from other pavilions. 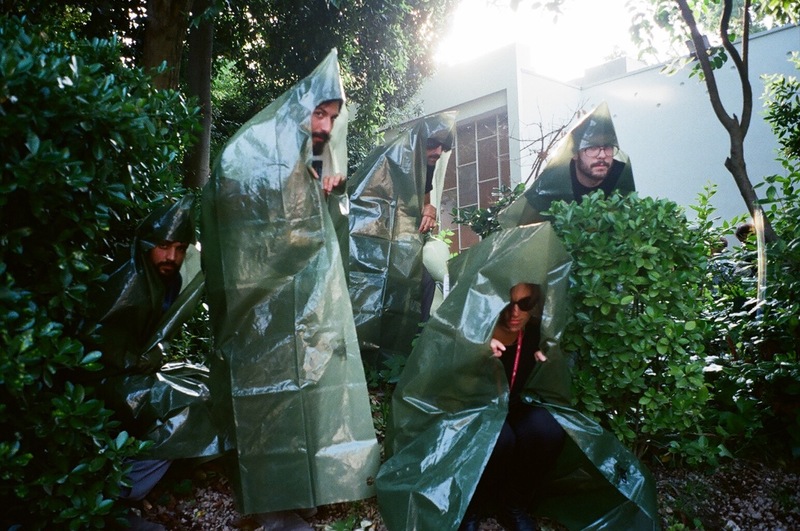 The action is a response to the concept of informality, as the curators claim that illegality is “a main component of informality beyond its pauperism and hypocritical perception.” The objects will be shipped back to Montevideo for an exhibition that reports from the front. You may have a hard time seeing the actual object, however, as the action has caused some controversy and some of the pricier booty has been returned, while the rest is hidden away. The Nordic Pavilion has a deceptively simple setup, as projects are presented bluntly on flyers. The curators constructed a wooden pyramid that acts as a social condenser and blocks the iconic trees in Sverre Finn’s famous building that many call the most beautiful in the Giardini. The new construction is a metaphor for the relationship of contemporary architects with the masters of Nordic architecture’s past. The pyramid obscures the trees, but still allows visitors to see them. It also gives a new perspective on the eight-foot-deep lightwell-roof-structure for which the building is known. Go climb the installation and look at the exquisite detailing of the board-formed concrete beams. This exhibition of Denise’s photos “from Venice to Venice” shows her broad range of interests in the 1950s and 1960s: automobile cities of the American Southwest, social change, multiculturalism, action, everyday architecture, “messy vitality,” iconography, and Pop Art. 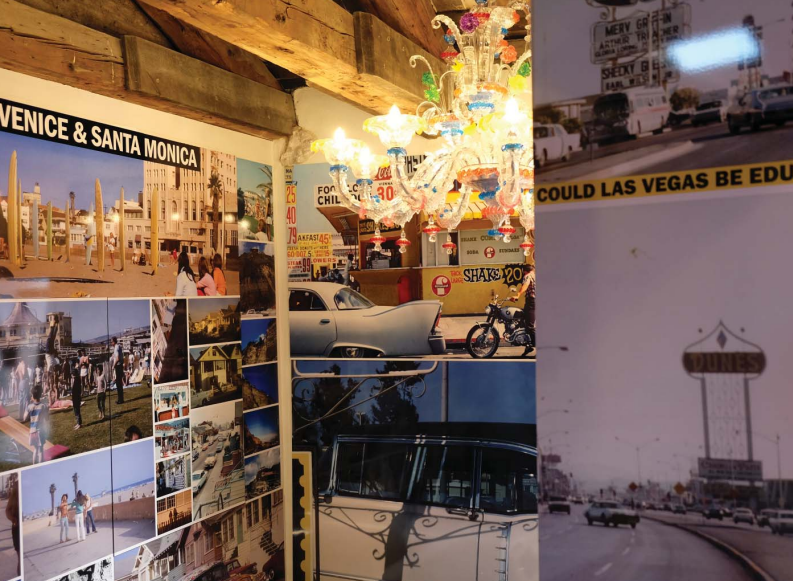 There is quite a bit to see in this show, which also includes strip signs and a Rezzonico-Tourisissimo chandelier, purpose-made for the show in Murano alongside her pictures of 1950s Venice and 1960s California and Nevada.